The young kobolds arrayed themselves around the field, each pair standing next to a hole as big around as their thighs. *Ready? * Krik asked her clutch, who flicked their tails in acknowledgement. As one, they dumped their buckets of excrement into the holes, then held the empty buckets over the holds. The kobolds holding the lids each stood ready, and one by one, their companions tipped the buckets quickly over, and the lids were slammed down. One of the lids didn’t come down fast enough and the bright flash of green, orange, and red told Krik that at least one of her clutch wouldn’t survive the night. Crested Worms aren’t actually worms at all, but are a cross between a snake and a millipede, with thin black striped jade green scales, a bright orange crest atop its fanged head, and red jowl-like poison sacks hanging down below its mouth, and seemingly hundreds of tiny legs along the bottom 80% of their length. They range in size from 4’-8’ long. Crested worm venom is highly corrosive, and is used to allow them to burrow through the ground, creating massive warrens, even in stone. They can spit their venom up to 15’ away, taking a -2 to hit at 10’ and a -4 at 15’. Anyone struck by the venom will take 1d3 points of damage, and must make a saving throw vs dragons breath. Failure means the venom will continue to burn for 1d3 damage for 1d6 additional rounds, and any armor worn will be reduced in effectiveness by 1 point for every round the venom burns. Charm City Game Day is 7/19! The semi-annual Charm City Game day is scheduled for July 19th at Games and Stuff in Glen Burnie. There are morning and afternoon games being played... 14 in total! 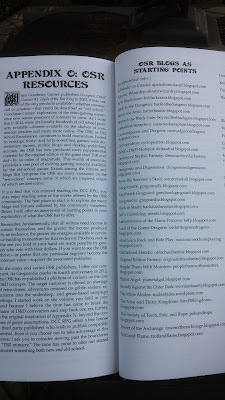 And you'll find everything from Traveller to DCC to Star Wars to Fate to Dungeon World... I've had a blast every time I've gone, and I'll be running a morning DCC session: +Daniel Bishop's Prince Charming. Reanimator. Signups are open today! I hope to see you there! When Gloriana is in your heart and your sword hand, the purity of battle can cleanse the earth of the foulest corruption. Our exploration of this dwarven temple revealed some amazing discoveries, including some fabulous treasure… guarded by a black wyrm! Truly though, calling it anything more than a hatchling would be a stretch, and our coordinated efforts managed to slay it before it could land a solid blow. Blessings to Gloriana for giving me first blood on the foul beast. The existence of a black dragon with the kobolds does make me wonder at their dark desire to take the egg of Galversharn. We also discovered Idhrenwen, along with two captured goblins that our guide was on the lookout for. We kept our word, and released them back to their tribe. Further into the temple we found the sanctuary itself, and two kobold sorcerers performing a dark ritual that involved the egg, and a hammer. The panic that seized my heart when the foul sorcerer picked up the hammer… I flew at them across the room while my companions shot at them with their crossbows. Gloriana’s blessing was surely upon us, for the sorcerer with the hammer tried to go through me to get to the egg, and slipped on some of the spilled blood, falling to the floor! The battle was fast, and we managed to save the egg, though we did have to wash it clean of the blood that had been poured on it. 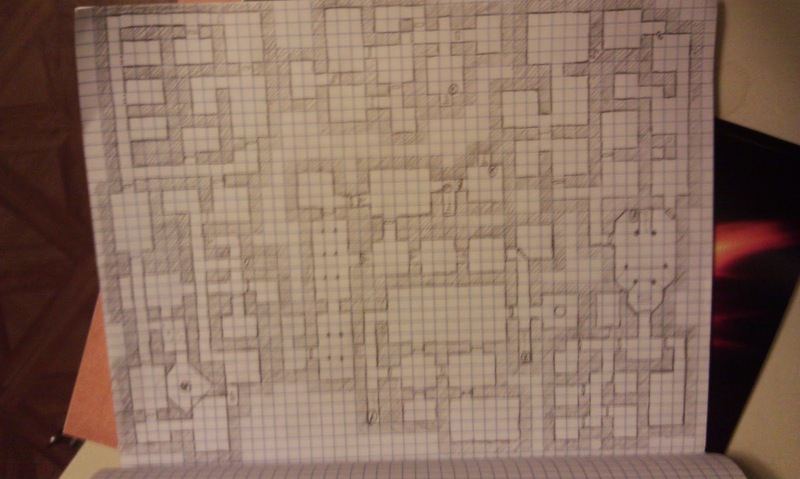 Further exploration of the dwarven temple revealed more treasure, a magical sword, and an undead giant snake. The necromatic energy that animated the snake was swiftly beaten out of the dead body. We’ve opted to carefully pack the egg, and depart in the morning to return it. Thankfully Idhrenwen knows where the wyrm lairs, so we don’t have to protect the egg longer than absolutely necessary. She says the journey will take 2-3 days. While I want to be return the egg as quickly as possible, it needs to be intact. Firesday 16th Arist, 1096 md. The beauty of the sunrise is Gloriana’s call to arms. Whether you go to plow a field, or reap on a battlefield, do it with the strength of the light in your heart. We struck out early, taking what Idhrenwen called the safer path. The day was blessedly uneventful, save for the occasional verbal sniping between our dark elf paladin Dobh, and Idhrenwen. Swordsday, 17th Arist, 1096 md. Keep your arm strong, and your heart stronger, so when you go to battle Gloriana can keep you from the darkness. Idhrenwen opted not to kill the bear that was ahead of us on the path, instead shooing it off. Not necessarily the choice I’d have made, since a bear skin cloak would be wonderfully warm, and bear steaks for dinner would have been a bit more palatable than my rations. The path continues to be clear, and otherwise uneventful. Dobh and Idhrenwen have settled into an uncomfortable silence. Saintsday, 18th Arist, 1096 md. Gloriana wields a sword in one hand, and a shield in the other. In the same way, you should find balance in your life. Dragons… are stunning and awful to behold. We returned the egg, and quickly departed. The paths stretch out before us… Which to take? We should return to Caer Brennau first to let them know of our success to ease their minds and hearts... and, I must admit, to satisfy my own prideful desires to be hailed as heroes. Perhaps after we should return to deal with the goblins now that our truce with them is passed? I will have to pray on it. I arrived to Titan Games & Hobbies bright and early… a little too early it turned out. It was scheduled to be a busy day, starting with a small Warhammer Fantasy tournament, Free RPG Day events, and a magic tournament, plus the usual open gaming and hobby activities. I claimed a nice big table in the middle of the store to run DCC, and then spent a while watching the Warhammer games. Around 1pm I had enough players to sit down and start playing. My table consisted of 2 guys who were pretty familiar with D&D, though neither had played DCC, and a mother and her younger son (8? maybe 10?). I dropped the pile of level 0s on the table, and let them pick their 4 to play. 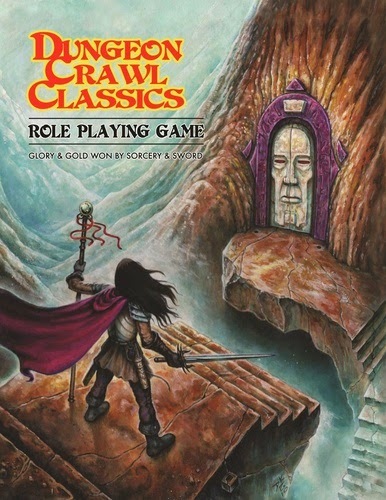 I went over the basics of DCC, and then jumped right into the adventure. One weird thing - no one else brought dice! I don’t go anywhere without at least one set (I keep a spare set in the car… you never know). Luckily I brought my dice bin, and shared out some d20s, d6s, and d4s for everyone to use. Dr. Chapman did his thing, and the peasants were suitably impressed by him. I did decide to add to his titles a bit - “Doctor, Doctor, Magus, Court Wizard of Castle Sefton, Wizard of the 9th Circle, etc. etc.” He passed out the holy symbol, orb, and buckler. From the tower the peasants made it into the castle’s courtyard. The tax collector decided he wanted to bring his pony into the castle, so tried to go through the gap in the wall. The other 15 peasants watched in horror as rose covered vines shot out wrapping the tax collector in their thorny embrace, draining him of all vitality, and dropping his dry brittle bones to the ground. They opted to explore the stable, and found the tunnel to the kitchen. The drop-crawler freaked them out more, but missed it’s attacks. Pulling the terrified peasant from the tunnel, the drop-crawler chased after them, and was smashed repeatedly in the general head area by shovels. Everyone breathed a sigh of relief… until the second one crawled out of the hole! This one was also dispatched, and then the dwarven stone-worker went through the tunnel, and declared that the kitchen was both unsafe and empty of anything of value. 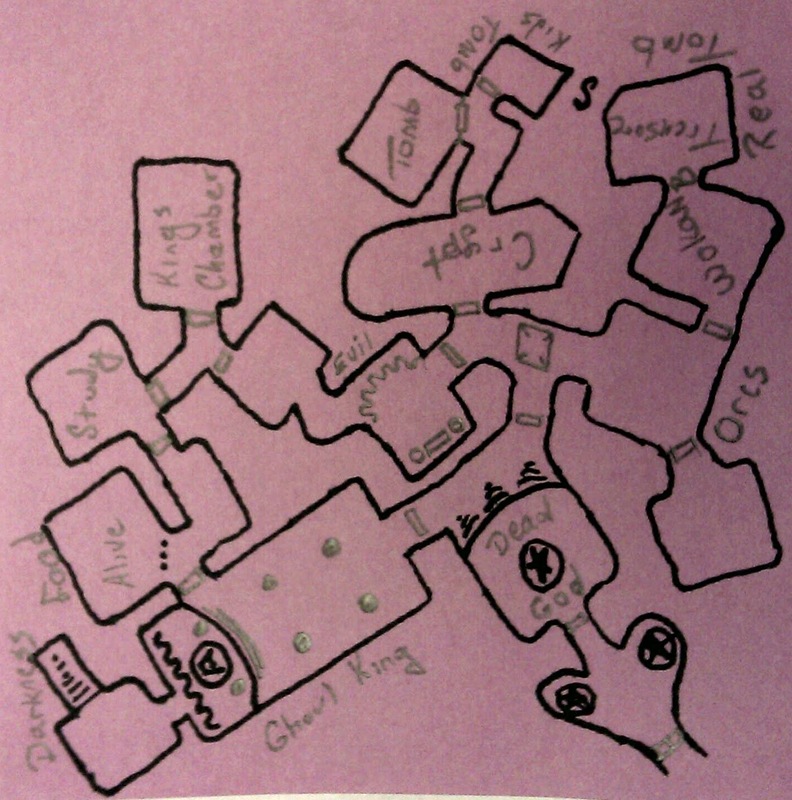 The peasants then decided that they’d go straight into the castle’s main keep. Seeing the poor condition of the great doors, they used their 10 foot pole to try to open it up. They succeeded, and as I described the door falling, I slammed my hand on the table, causing all of my players to jump. They very carefully entered the great hall, and one of the dwarves smashed skeletons as he went. The 5 ladies asleep at the table woke as the peasants entered, and distributed their gifts and words of wisdom. I’m not entirely sure they picked up on who the ladies were…. A judicious use of the golden orb pointed the peasants in the right direction to find Aurora. The bottomless pit flummoxed them a bit, though they did manage to get a rope tied to the far door with an improvised grappling hook. The first character made it across ok, but the second fell… Eventually someone used the mirror of truth, and dispelled the illusion for the party. The same trick revealed the truth of the sleeping princess. 3/4 of my players hung around to level up their remaining characters, including the mother and son, and everyone who played (and a few who didn’t) said they were VERY interested in knowing if I was going to run something regularly. All in all I thought the adventure went really well. I was disappointed that the players missed the hobyahs completely, and kind of glad that I avoided a TPK with the dragon. Especially since I had a younger player at the table. Didn't stop me from killing off a few of his level 0s... in fact everyone lost at least 2 characters, except the guy to the bottom left in the pic above... he didn't lose a single one! The guy to the bottom right lost 3, and his 4th was injured. My favorite part of the adventure was playing the imp. I’m pretty sure I was *this close* to getting them to open the bottle. I'm hoping that when I run this at the next Charm City Game Day, they'll stick around for Aurora's awakening. Aside from my game, I know someone ran some Kobolds ate My Baby but that was the only other RPG I saw getting played. The free stuff wasn’t even pulled out until my game wrapped up, but then that meant I got the pick of the litter, snagging the 3 things I really wanted: The DCC/XCrawl, LotFP, and C&C modules. I was pleased to see just how busy the store was, I just wish a bit more was RPG related. However, given that it’s the closest store to my house, I’m strongly considering doing a DCC campaign there. The Mudmaw is a giant 6 legged toad demon covered in spikes, plates, and warty bumps. It is incredibly lazy and disinclined to move from the mudpits it creates around itself wherever it is found. The sticky sweet smell of rot permeates its lair, while the buzzing of the giant flies that are drawn to it both drowns out most sounds, and drives most humanoids to distraction (save vs spells or suffer -1 to AC and attack rolls). In combat, the Mudmaw will use it’s barbed tongue to entrap its enemies, and try to swallow them. 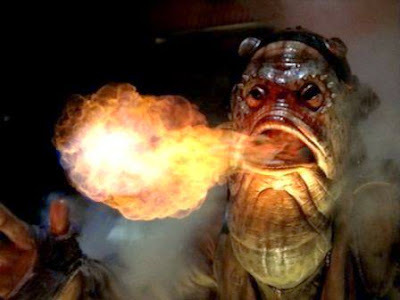 Anyone struck by the tongue must make a save vs dragons breath or be caught and unable to move or attack. The following round the mudmaw will pull the victim into its mouth, swallowing them. Anyone swallowed will take an automatic 3d6 points of damage every round until dead. If the tongue is attacked while holding someone and 12 points of damage are done to it, it will release it’s hold. This damage is not subtracted from the Mudmaw’s total. It will target the smallest and least armored foes first, since they’re easier to chew. The Mudmaw can also cause the mud around it to boil explosively. Every round, the Mudmaw will pick a spot that will begin to bubble. The following round the mud will explode, causing 1d10 damage to everyone within 20’. Anyone who closes in to attack the Mudmaw from behind, hoping to avoid the tongue will be kicked for 3d8 points of damage, and will be knocked back. The Mudmaw can kick twice every round. As a demonic entity, the Mudmaw is immune to non-magical weapons, sleep, charm, and hold spells. It takes damage from holy water, and can be turned as a lich. 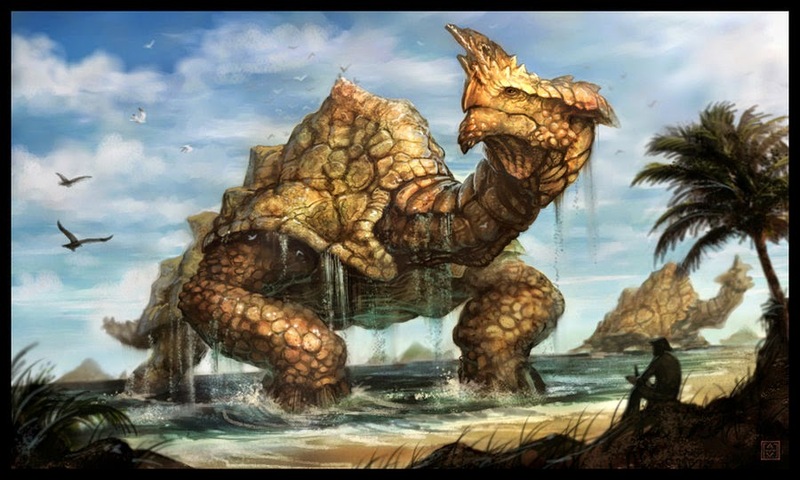 Turned results will cause the Mudmaw to sink into the mud, and refrain from using its tongue attack for 1d6 rounds. It will still use the exploding mud effect, and anyone foolish enough to come within range will still be kicked. A Destroyed result will banish the demon back to the chaos it was formed from. 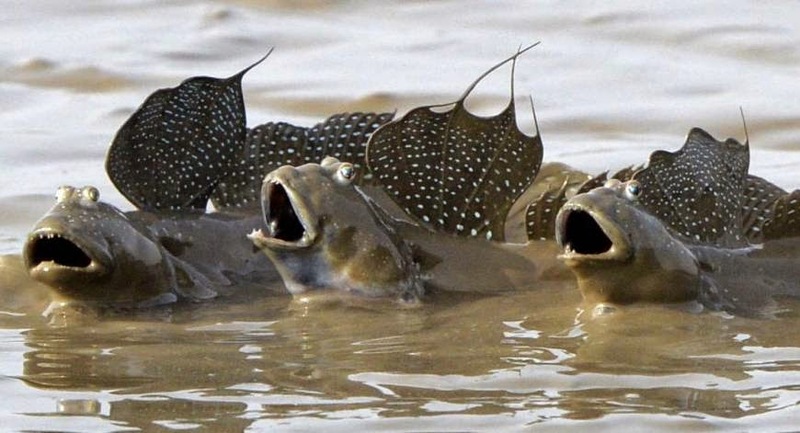 When the Mudmaw reaches half hitpoints 2d12+6 Mudskippers (larval Mudmaws) will emerge from the Mudmaw’s back, diving into the mudpit and attacking anything they can reach. The Mudmaw’s treasure is all found within its gullet. Any potions and scrolls will have a 75% chance of having been ruined in the beasts gullet. If banished, the treasure goes with it! There's a chance I'll be at the beach today reading my Free RPG Day swag, so I wanted to pick something thematic for today. 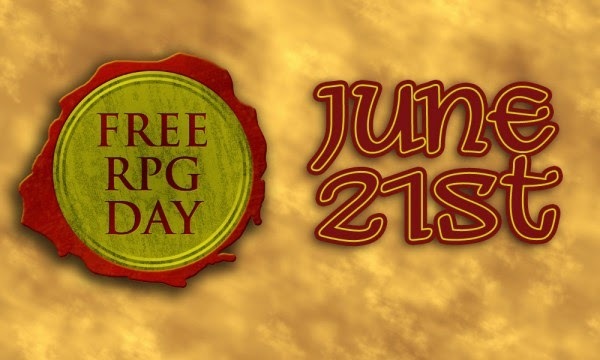 If you didn’t already know, today is both the first day of summer and also (more importantly) Free RPG Day! I’ll be at Titan Games and Hobbies, set up to run DCC for anyone interested in playing, and I’ll have a nice little swag pack thanks to Goodman Games to share with my players. One thing, if you do go and snag something, remember that it’s free for you, but it wasn’t free for the store. Support your FLGS, and buy something while you’re there. Maybe a new set of dice, or a mini. Maybe a new game? Need to find a participating store? Click here! Spellburn is part of the Wild Games Productions/D20 Radio group, and follows the same basic format as it’s other shows, starting with what the podcasters have done in gaming, then hitting e-mail, and then getting into the meat of whatever topic they’re covering from the player’s perspective, then the DM’s perspective. As with the other D20 Radio shows, I think the breaks between the different sections takes just a little too long, and is a little too loud as compared to the rest of the show. This is a big deal for me, since I usually listen to podcasts using headphones. Having it suddenly get really loud just reminds me too much of those TV commercials that used to blast out at twice the volume of the show that it interrupted. Aside from that relatively minor quibble, the content is really solid. The first set of episodes focuses on the core aspects of the DCC game, from basic rules to character classes (1 per episode!) to the spell system, to monsters. It’s basically DCC 101 over something like 12 hours as taught by two judges (DMs) and a player. Spellburn starts out with a cast of 3 judges: +Jobe, +Jim, and +Jeffrey. Judge +Jen joined the band with episode 22. One of the nice aspects of this is that none of these guys are pros, and there are times they interpret rules differently, which leads to some really in-depth discussion including their at the table experiences. In addition, their guests on the show have included notables in the DCC-verse as +Michael Curtis, +Harley Stroh, and +Daniel Bishop. 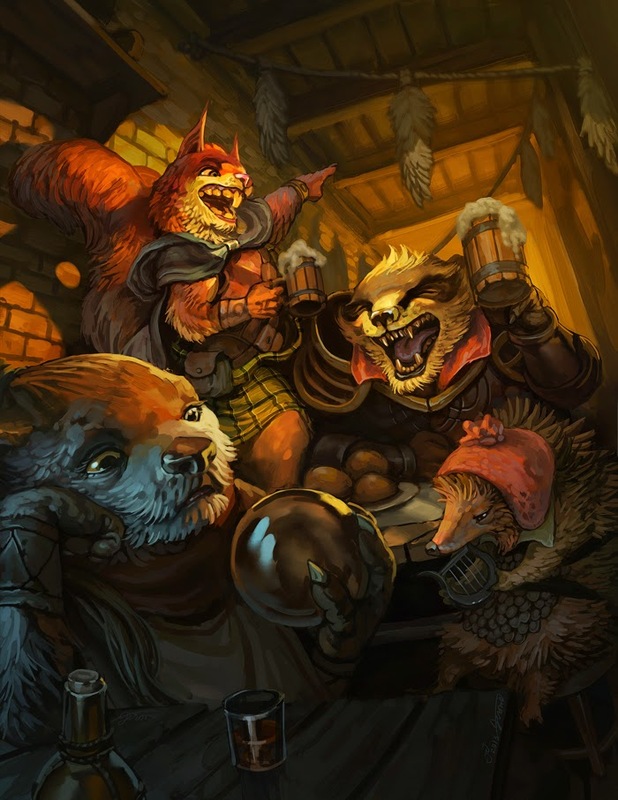 The Iron Tavern is the actual play podcast of one of the judges from Spellburn, Jeffrey Tadlock, and follows the adventures of his long running (since August 2012) DCC group. The podcast picks up with most of the group in the level 4-5 range, so drops you into the middle of the action without much background. Personally I kinda liked that. It was very Episode IV that way. The players are nicely invested in both their characters and the game world in general, and shows very clearly how well DCC can work with long term campaigns. One of the things I didn’t expect was how the players seemed to really embrace the weird results. For example, in a later episode, the cleric continually failed to cast spells, and kept racking up disapproval from his god. In game, his character pointed out that his god didn’t approve of the groups course of action. This same player/character switched gods earlier in the game (pre-podcast) for what sounded like similar reasons. If you’re at all interested in what DCC is all about, these two podcasts are a great place to start. The streets sweltered with the stench of the unwashed, and no movement disturbed the stillness of the midday sun. The companions rested like nearly everyone else in the town in the stone basements that offered a shadowed hint of coolness. “Feris, can’t you do something about this?” Nimble whined. The companions shivered as the basement filled instantly with a cool drizzle. “Anything?” a voice hissed in Nimble’s head. This ring is crafted of a near black unknown metal set all around with small diamond chips that radiates a faint magical trace. When worn, and a desire expressed, there is a 50% chance that something will reply with an offer to fulfil the wearer’s desire. The something (usually a demon/devil) usually does not have the wearer’s best interests at heart. This is not as powerful as a ring of wishes, and is cataloged as a ‘Ring of Petty Desires’ in Emirikol’s Grimoire of Infernal Secrets. 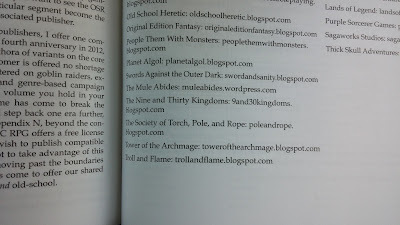 Back in 2010 I came up with this Magic Book Name Generator. Not bad, and it still gets viewed pretty regularly. However, after 4 years, it needed an upgrade from rolling d20s to d30s. I had the good fortune to find a first print copy of the DCC rulebook at a used book store for $25 around Christmas. I was wary of DCC initially. I’d had the beta PDF, and liked it well enough, but I didn’t really see anything special about it at the time. Clearly I hadn’t done a very close reading of it. DCC makes a conscious decision to emulate the *ideal* of the 1970’s gonzo gaming roots found in Appendix N. This should not be confused with the reality of 1970’s gaming. This is a game that doesn’t take itself seriously, that turns it up to 11 by capping PCs to level 10, but starts them at level 0. The best thing about DCC is that the rules actually support the playstyle that the art implies, yet at the same time it’s serious enough that you can still take it semi-seriously. There’s solid long term campaign potential with DCC. In fact the combination of gonzo and lethal seems to make players more attached to their flawed characters. So I spent the better part of my holiday break reading the rulebook cover to cover… and there was a lot that was different. More than I realized when I look at the beta. Not only was it different, there was a lot that I liked, especially (this is probably not a shock) how DCC handles magic. I appreciate the patrons, the weird spell effects, the corruption. I wouldn’t want to do it for every game, but I think it’s the single biggest thing DCC has going for it. Given the space turned over to spells in the rule book, I think Joseph Goodman probably agrees with me. Or I agree with him, I guess. Wait, what's that down near the bottom? How cool is that? It certainly helped cement my interest in DCC! 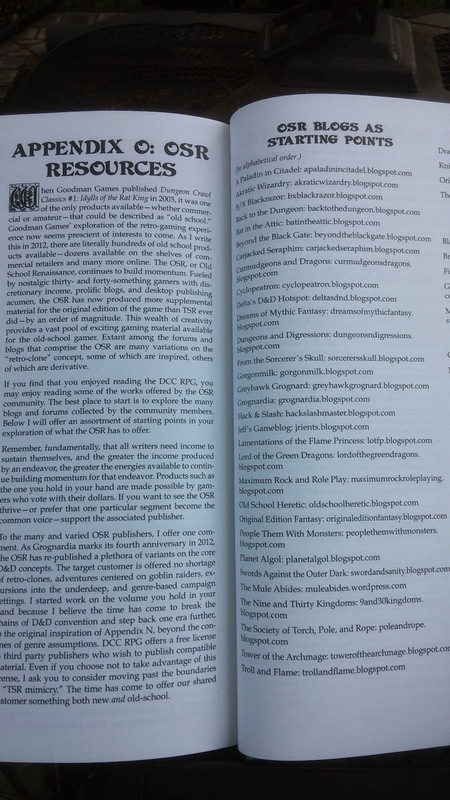 Fast forward to a little bit ago, and Michael Curtis, the author of Stonehell (still waiting on part 2) and the Dungeon Alphabet (along with a whole bunch of other stuff) posted about a DCC adventure he had written set in a fantasy Appalachia that he and Goodman Games were Kickstarting. As part of the publicity for it, he sat in on an episode of Spellburn, the DCC podcast. I’d never listened, but I like Michael’s stuff, so I listened, and then got in on it. Then I listened to the first episode, then the second, etc. In the span of a couple of weeks, I listened to the entire run of the podcast, and then I followed that up by listening to the Iron Tavern actual play DCC podcast. And now I’m signed up to run a game on Free RPG Day at Titan Games in a week, and another a month later at the Charm City Game Day at Games and Stuff. 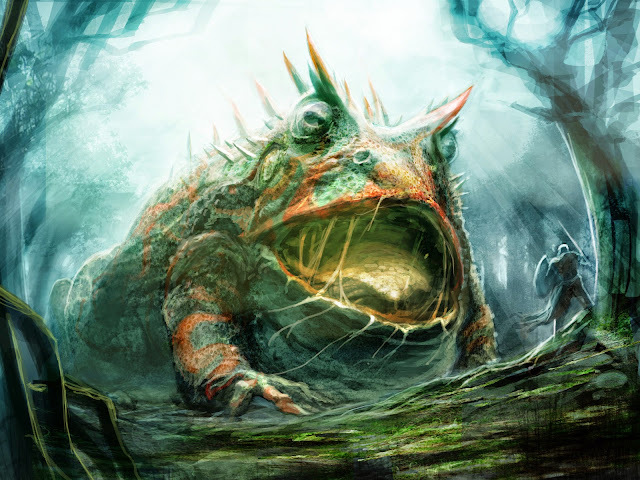 The anura Mogrimm's throat bulged before she answered. "Almost" Her fleshy lips smacked together. "The chamber is ready, and my knot is out collecting the last of the sacrifices." "Excellent" the cloaked figure's laugh was accompanied by the tinkling of small bells. "The dark moon approaches swiftly, and we wouldn't want to be late..."
The girl's scream was the only warning Rathgar heard. Smoke drifted through the barn's boards, and the horses stamped nervously. Grabbing his blade and his shield, he sprang up from his bed roll on the hay, and rushed to the small door. Allianora was already there, and Nimble right behind him. "Where's Feris?" "He left to use the necessary a couple of minutes ago." As they opened the door, the smoke from the burning farmhouse blew heavier toward them. "Nimble, take care of the animals. If one ember makes it over here..."
Squat figures moving about were silhouetted against the flames. "I hope Feris is ok." Allianora whispered. "Me too" Rathgar swept his gaze across the scene, and pointed to a cluster of the figures. "Let's go." These lumbering frogmen are belligerent, arrogant, and absolutely convinced of their own superiority. They’re also pretty stupid. They prefer to fight at range by spitting small fireballs at their opponents. These cause 1d6hp, and the target must make a saving throw or catch on fire. For melee combat they use polearms in combat, unless they are close to death, in which case they will switch to daggers and other close weapons. This suicidal tendency is due to the fact that upon death Anura tend to explode for 1d6 damage to all within 10’ who fail their saving throw. 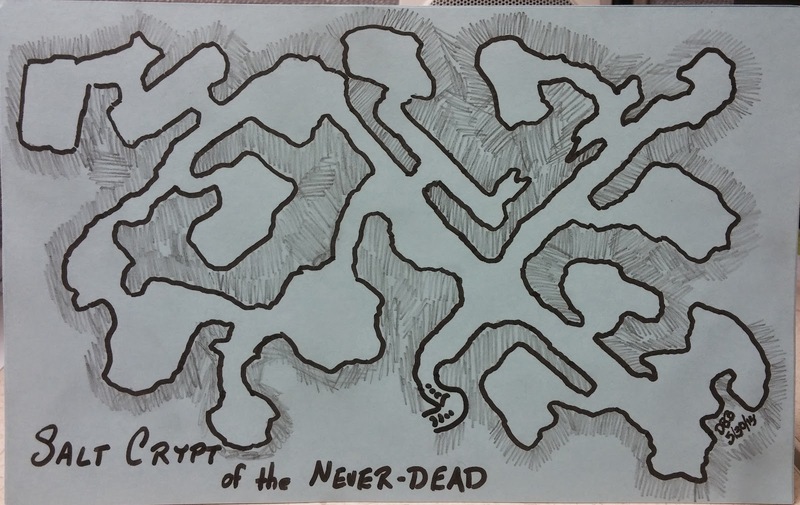 This was my entry into the 2nd round of Tenkar's OSR Superstar contest. It's Friday the 13th, and it seems like bad luck not to post something. 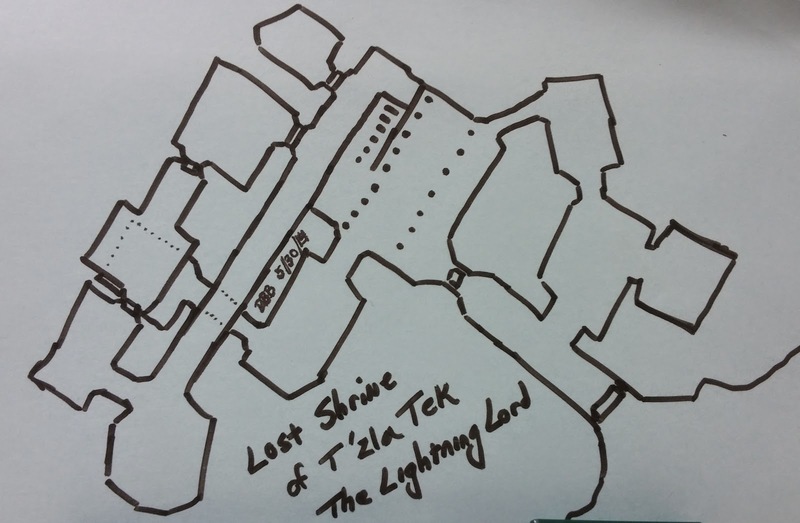 Unfortunately my post about DCC isn't anywhere near ready for posting yet, so instead here are some maps that I've done recently (this year). Feris crouched on the roof next to a smoking chimney. “Nimble?” he whispered. Feris nodded, and started toward the hatch as Nimble clamped down on his shoulder. “Quietly.” Feris nodded again, and began to weave his magic. He took his time, and Nimble waited as still as a statue. After agonizingly long minutes, the deed was done, and Feris nodded at his partner. Nimble’s job was faster, and after unlocking the hatch he oiled the hinges, and then gently began to lift. No light or noise emerged from the small gap, so Nimble eased the hatch all the way open. He then fed the rope tied to the chimney through the hole. As Nimble made ready to decend, Feris stopped him. “Another ward on the floor.” With a wave of his fingers over Nimble’s boots, Feris nodded. Nimble’s boots never touched the floor. 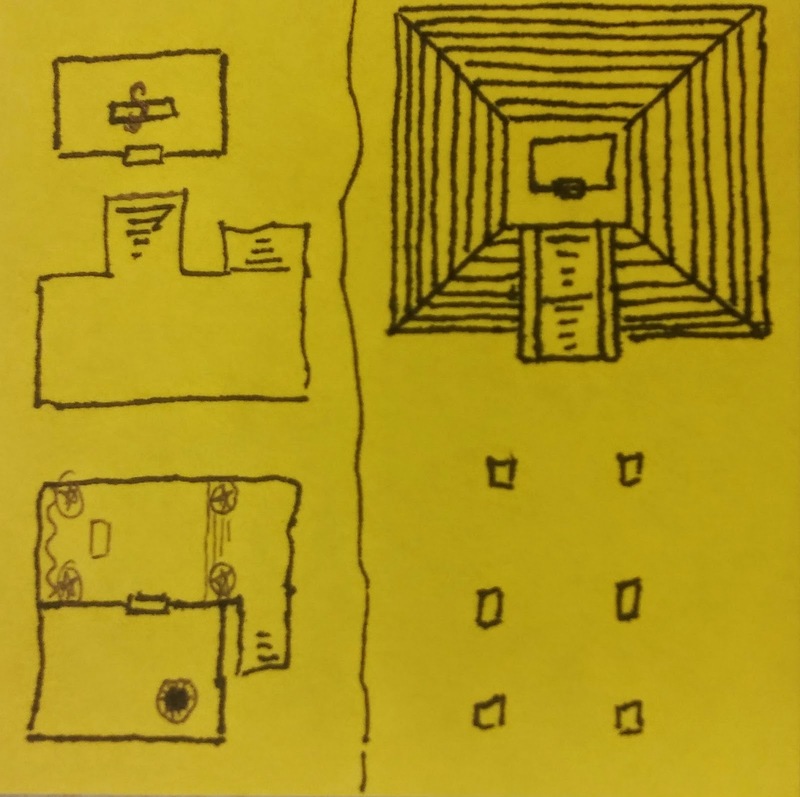 An odd sensation, but it ensured that the floorboards never creaked, in addition to bypassing the magical ward.Feris followed, and they soon found themselves in the display room of numerous treasures. In the center of the room was an ancient grimoire, a golden sword, and a crown of platinum leaves all sharing a red velvet draped plinth. Nimble and Feris ignored these treasures, and went to the far corner of the room where on a marble pillar stood a small statue. The artfully twisted pair of angels forming a column that cradled a sphere and was encircled at the base with strange runes. “I thought it was supposed to be a cup?” Nimble whispered. Feris closed his eyes a moment, and muttered another spell. Nimble saw the cup appear back on the pillar, and started to object when he noticed the weight of the cup still in the box. They smiled at each other and went for the door. 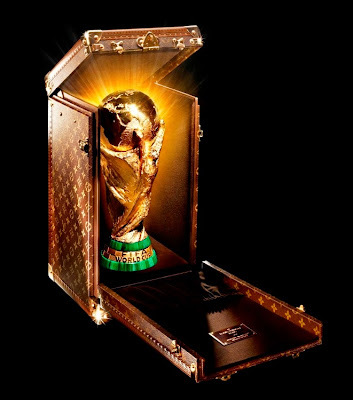 The World Cup is an ancient, powerful, but subtle magical artifact. 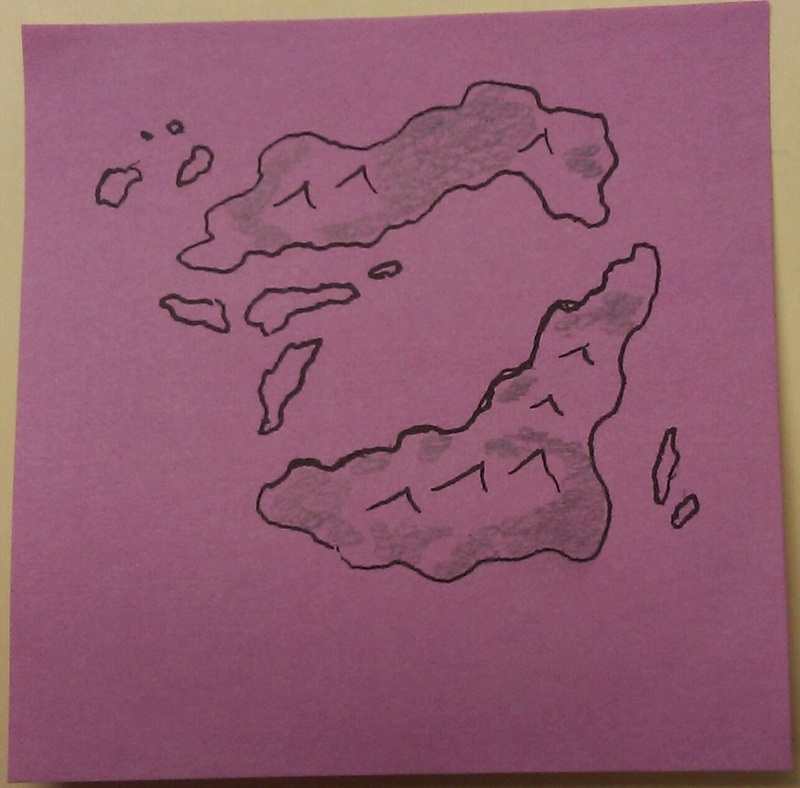 Its power can extend over an entire continent, or be limited to a small city state, depending on who holds it. When it is within the boundary of a state (of whatever size), and the people within know that they have it in their borders, there is a general improvement of the state’s morale and pride. This often manifests as higher production rates, an increased aggressiveness toward their neighbors, and (oddly enough) increased birth rates. The origin of The World Cup is lost to time, but every historical mention of it involves some type of conflict, including wars, games, and intrigue, between nations all trying to possess it. References to Stanley’s Cup are believed to reference the earliest state to possess the World Cup, though one sect, The Canuck Brothers of the Moose, vehemently (and sometimes violently) claims that it is a completely different item. Wineday 14th Arist, 1096 md. The Maiden of Battle is ever forthright in her action. Our attempts to subtly investigate the ruins of Marmor Quarry were less than successful. Gloriana truly does not reward the sneak. We encountered a goblin band that parlayed with us. They claimed that the kobolds to the south were to blame for angering the dragon. While there was a certain temptation to wipe the goblin skum from existence, the information they offered, and the scout they provided to show the way were too valuable to waste. If they are telling the truth then it’s vitally important follow the scout and find the egg. The goblin brought us to an ancient ruin after hours of trapsing through the wilderness. 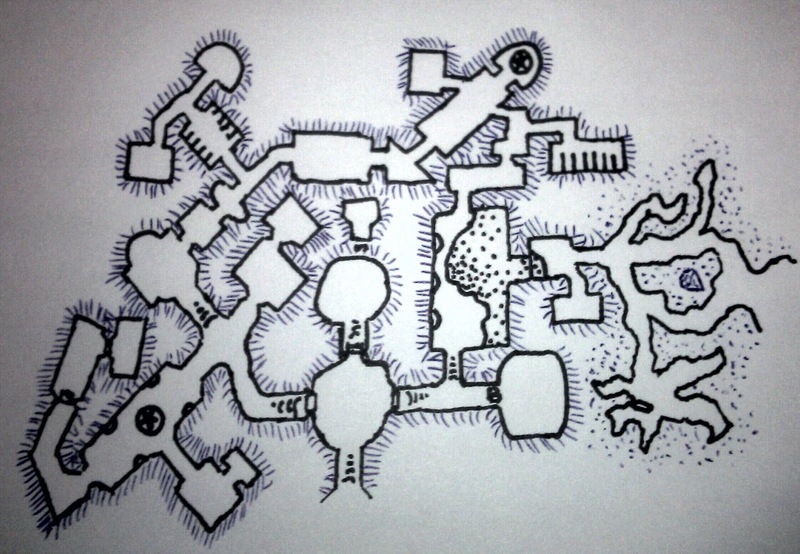 We descended the stairs into the dungeon, and discovered an old but well maintained structure. Several locked doors defeated our rogue Mukora, so we ended up at the end of a long hallway. Beyond this last door was the lair of the kobolds. Gloriana rewarded our frontal assault by causing the monsters’ weapons to fail them, often in the most bloody and spectacular ways. In spite of this, it was a hard fought battle and one that we would not have survived without the blessing of Gloriana. As it was we lost our companion Mukora to the terrible ravaging of a giant weasel. The last of the kobolds fled out a side door, which locked behind them. Bloody, bruised, and down one party member, we’ve opted to barricade ourselves in the kobold lair to rest up. Thunderday, 15th Arist, 1096 md. The rising sun is the cleansing fire of Gloriana’s light and truth. I could not see the sun, yet could still feel Gloriana’s power refresh me far more than even the sweetest sleep on a bed of feathers. Today we hunt the remaining kobolds, and recover the egg! Working on my A to Z PDF has hit a bit of a snag. The honest truth is that I barely know what I’m doing in GIMP, and trying to make the maps I want is going to involve more time/effort then I really want to put into it. 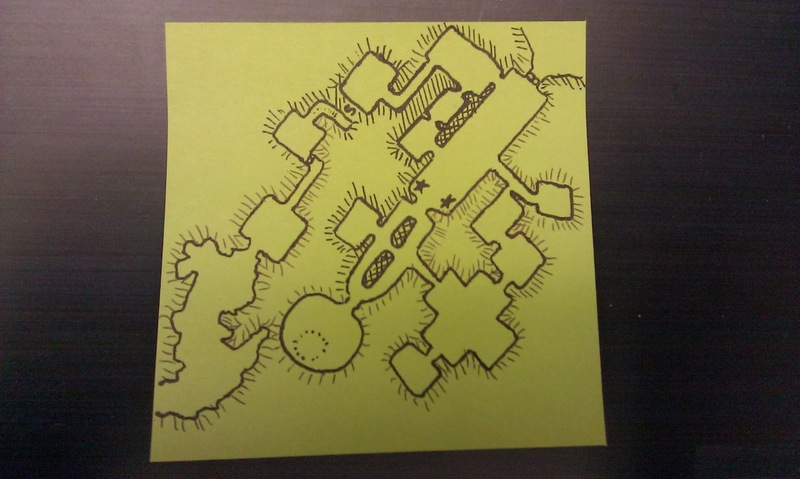 As much as I love a beautifully rendered map, I don’t have that much interest in learning how to do it myself. As it is, I’ve spent hours figuring out how to make a simple star and put it on a star background. One star. Do my own unpolished art, and not worry about it. 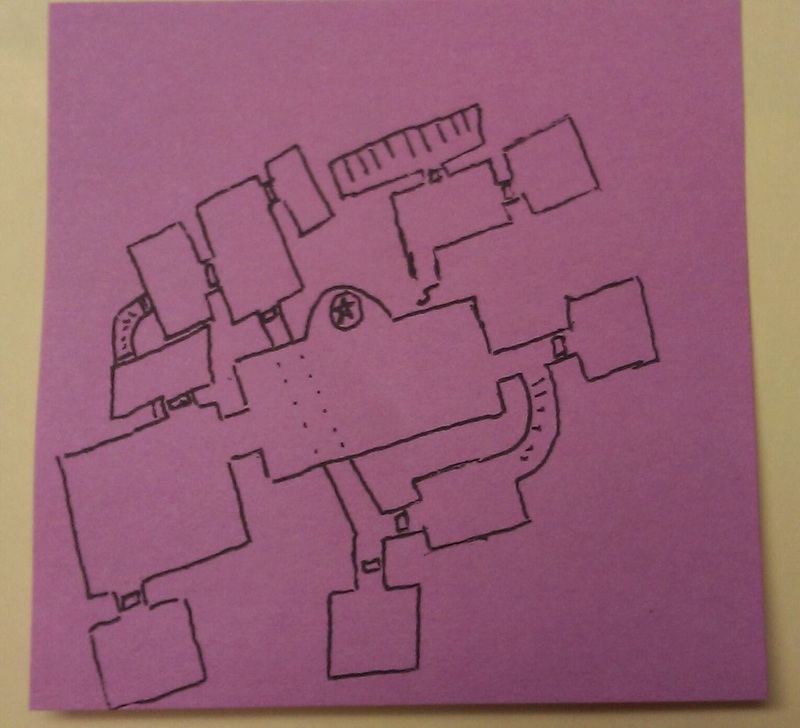 Look into finding someone who could do the map(s) for me. This would probably involve some cash. I have no idea how much. 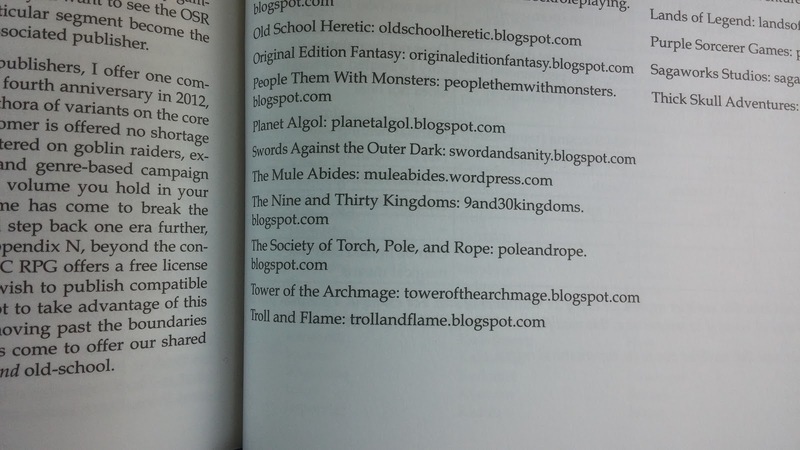 This would also probably involve putting it up on RPGNow, to try to recoup some costs. Just leave it with the blog posts, and don’t worry about doing a PDF. Maybe a semi/quasi/kinda sorta professional looking star map wouldn’t be that expensive? Where do I even look? Deviant Art? Somewhere else? Anyone want to make me a star map? "By Zagyg's beard, get it off!" Nimble yelled, tugging at the thing stuck to his leg. It's teeth and claws held on tightly until Feris zapped it with a bolt of golden energy. "Look out, there's more!" He warned. The companions backed away from the muddy edge of the pond as numerous red eyes appeared from the much. Several of the creatures popped out of the mud, leaping toward the companions, only to be felled mid-flight by Feris' wand. "Is that sulfur?" "Demon leaches?!?" Rathgar burst out. "Like the natural things aren't bad enough?" "I don't think they're leaches." Allianora poked one of the dead things with her boot. "These have fins... clawed fins. They're more like tadpoles. But they are demonic, and we need some water." Her holy symbol glowed as she held it up and stepped into the mud. The sizzle and pop of demonic beings was music to Nimble's ears. Mudskippers are demonic 3’ tadpoles with 6 clawed flippers and a lamprey like mouth. They attack as 3HD monsters, and whenever they successfully bite an opponent, they will latch on and cause an automatic 1d4 points of damage every round until killed or turned. In water or mud they can speed along much faster than on dry land. 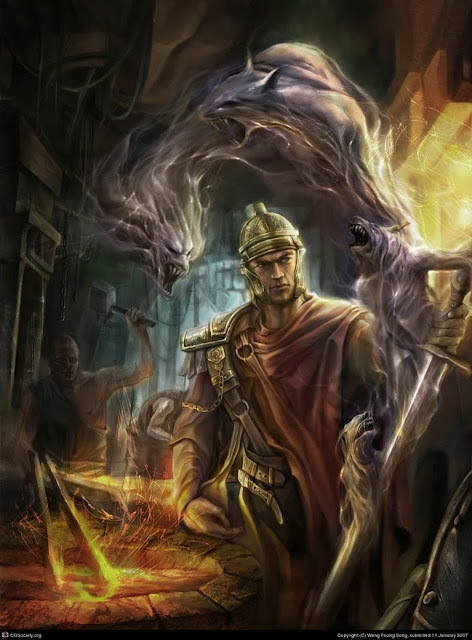 As demons, they are immune to sleep, charm, and hold spells, and non-magic items. They can be turned as zombies.